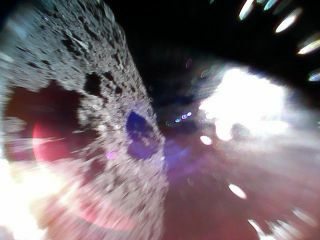 This spectacular photo shows the view from asteroid Ryugu from the Minerva-II1A rover during a hop after it successfully landed on Sept. 21, 2018. The probe is one of two that landed on Ryugu from the Japanese Aerospace Exploration Agency's Hayabusa2 spacecraft. It's the first time two mobile rovers landed on an asteroid. In order to complete the deployment, the main spacecraft of the Hayabusa2 mission lowered itself carefully down toward the surface until it was just 180 feet (55 meters) up. After the rovers were on their way, the spacecraft raised itself back up to its typical altitude of about 12.5 miles above the asteroid's surface (20 kilometers). Editor's note: This story was updated to correct the deployment descent altitude in feet; the measurement in meters remains correct.